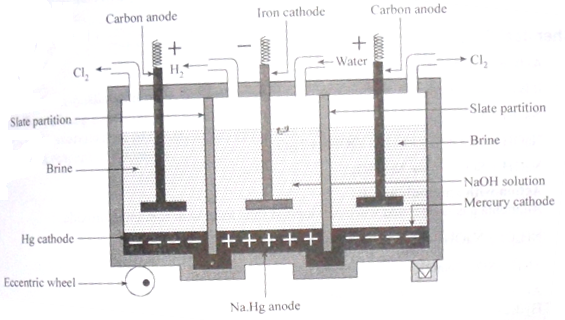 It consist mercury cathode cell which is a rectangular vessel divided into three compartments by a non-porous slate partition which do not touch the bottom of the cell. A layer of mercury seperates each compartments at the bottom of the cell. One end of the cell is pivoted and the rest of the part rests on an incentric wheel, which gives the rocking motion to the cell so mercury can circulate from one compartment to other. Hence, the amount of NaOH is about 20% in the cell. It is pumped and casted into pallets.